Posted March 12, 2018 by Shelley Gist & filed under Featured News, News. In honor of Women’s History Month, the Carolina Women’s Center is featuring blog posts by UNC student Lydia McInnes. Lydia’s writing celebrates some notable women throughout history. In remembering their actions, we honor their memory and their contributions to all women. The product of an arranged marriage, Kusama was born into a wealthy but dysfunctional Japanese family, emotionally and physically abused by her mother and sent to her spy on her father’s extramarital affairs. Her mother often made her report back on her father’s sexual exploits, which led to a lasting trauma of both sexual obsession and aversion that often appeared in her later artwork as a focus on the phallus and the female body. She started painting at age 10 after she began to experience intense audio-visual hallucinations, using those hallucinations to create dizzying painting and patterns of endless dots, lines, and spirals. In an interview with The Washington Post, she described her repetitive patterned works as attempts to “obliterate” her thoughts, with art becoming a form of therapy, or “art-medicine” for her as she came to terms with the neurosis that only eased when she painted. She studied traditional Japanese painting in Kyoto in 1948, but she eventually grew frustrated with the strictly regulated, traditional Japanese style of Nihonga – a style of Japanese art similar to Western oil painting but with traditional Japanese materials – and left for New York in 1957. There, she found herself in the midst of the post-war New York avant-garde art scene, but she diverged from the popular style of the time – a style popularized by Jackson Pollock called action painting that involves abstract brushwork and vigorous paint spatters to imitate motion – to do her own large-scale monochromatic pieces. She later expanded to drawings, sculptures, installations, fashion design, and even film. 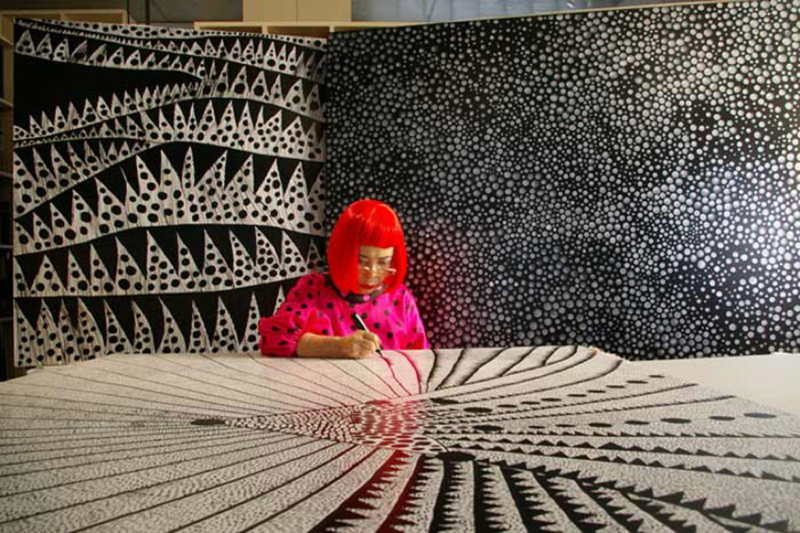 She founded Kusama Enterprises in 1969 to sell clothing, bags, and cars printed with her dizzying designs. While her art exists in a category of its own, she uses a style that combines several different approaches, including feminist art, abstract expressionism, and minimalism. Her work is often considered a precursor to the Pop Art movement of the 1950s and ‘60s. This style, popularized by Andy Warhol and others, focuses on individual subject matter with heavy iconographic use. Kusama has even been cited as influence on Warhol and other famous artists of the Pop Art movement. In many ways, her art defies the classification with any and all modern art movements, but it is still revered and enjoyed by many for its intense and, at times, palpably bizarre style. Kusama moved back to Japan in 1973 and entered Seiwa Hospital in 1975 for treatment of her obsessive-compulsive neurosis, but she continued to produce artwork in her unique creative style, even adding poetry and fiction to her creative canon in the 1980s. Her most recent exhibition was on display February 2017 in the Hirshorn Musuem and Sculpture Park in Washington D.C. 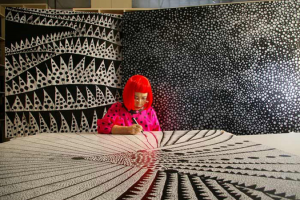 In many ways, Kusama’s mental illness has also been her artistic strength as she has built her entire artistic style on the dizzying “Dot Obsessions” paintings inspired by her hallucinations. She also used her artwork as a platform to challenge traditional notions of a conservative female-effacing Japanese culture at a time when most women, Kusama included, were expected to become dutiful housewives rather than creative beings in their own right. Despite not qualifying in any single “popular” modern art movement, art historians, critics, and fans should remember the legacy of the person behind such dizzying designs and how her struggles with mental illness have also given her great strength.